First cut off the ends of the eggplant, before slicing into 3/4-inch thick sections. Transfer the slices to a plate lined with a paper towel. Generously sprinkle salt on both sides and let sit for 30 minutes. When ready, dry off any excess water from the eggplant with another paper towel. Set aside. Next, preheat the oven to 375° F and line a baking sheet with parchment paper. Place the eggplant slices over the sheet and dress with the olive oil and Italian herbs. Bake for 20-25 minutes. When done, carefully remove from the oven and add a bit of marinara sauce over each slice. Then top with a few strips of basil and some grated mozzarella cheese. Return to the oven for five minutes under the broil setting, until the cheese has melted and begun to lightly brown. If you would like to give your pizza a spicy touch, try sprinkling some red pepper flakes over the marinara sauce. 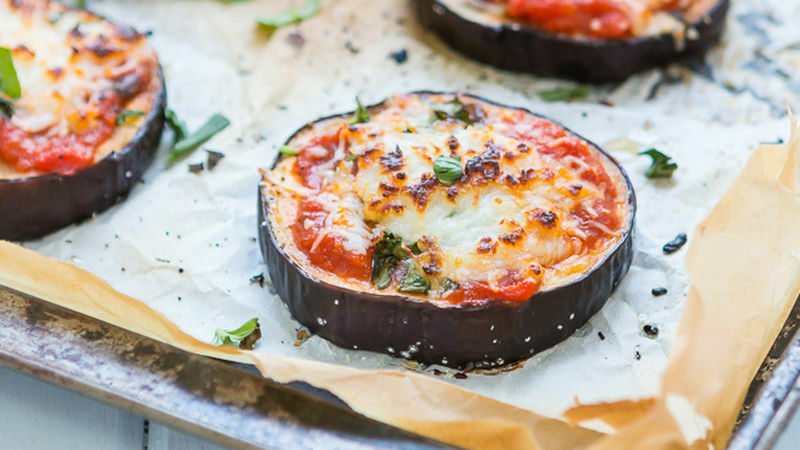 I have to confess that I'm not an eggplant lover but this recipe is exquisita. It's so rica that my children eat it without any protest! It's ideal for a light lunch, or even an appetizer at parties when sliced into smaller pieces. Be sure to make enough since everyone will want seconds.